The W 3033 is a front load washer which features a clean white exterior finish, large capacity, and an array of useful features. It has Advanced Touchtronic Controls for easy use, 11 wash programs and 6 standard wash programs. It also has 6 drum spin speeds and a child lock feature. Stainless steel honeycomb washing drum improves cleaning performance and lessens fabric wear. 11 Master Care wash programs lets you choose the right program for your washing needs. Digital program countdown display lets you know how much time is remaining. Hydraulic suspension feature gives the drum added stability. Unit comes in a white color for that understated yet classic look. Front loading style gives easy access during washing. Child lock features makes this appliance safe even when there are children in the house. The control panel is easy to use and is elegantly designed. Total Volume: 2.52 Cu. Ft. This washing machine comes with a large capacity, making them ideal when you're doing heavy loads on a regular basis. The washing drum is made from the best quality stainless steel which aids in better washer performance and keeps clothes clean and free from wear. With its 11 Master Care wash programs and 6 standard wash programs, you have more than a few options when it comes to thorough washing. This washer provides thorough cleaning yet ensures gentle care, so your clothes stay clean and protected at all times. Unique honeycomb design of the washing drum results in improved cleaning performance. Allows for the easy adjustment of water level, temperature, as well as soak and spin speeds. Washer comes with a durable steel door hinge and glass door. This model comes with internal heating elements which automatically raises water temperature for sanitization purposes. You can also easily lower the water temperature to avoid scalding accidents. Integrated panel design makes it easier for you to blend this washer with the existing design of your home. One of the disadvantages with this washer is the price. Some customers have found the washing machine to be quite expensive. The washing machine is prone to functional problems, and some users needed to have their washer fixed on a regular basis. This washer also comes with a few design considerations, such as the porthole door available only in right hinge. Also, the washer is available only in the white finish variety. 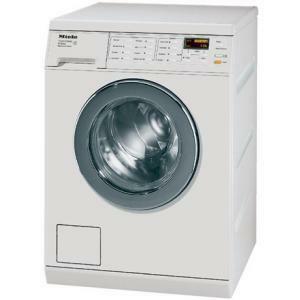 Comments for Miele W3033 24" Front Load Washer 2.52 cu. ft. I bought this washing machine a year ago. Because of the doorway size in our laundry room, I had to buy a compact washing machine. So I bought this Miele, only because of the size, even though it was quite expensive. After a year of use, I am so pleased with this washing machine. We have horses, and this machine can wash dirty saddle pads and horse bandages and then wash delicate wools and linens. Everything comes out clean and white. Some old clothes and towels that looked dingy before we had the Miele, now look bright and clean. This washing machine was worth every penny. When the machine first came home, my daughter washed every piece of clothing that she had because it cleaned so well. She also gets rashes easily, but has never had any trouble with clothes washed in the Miele. I am so happy with the Miele washer and dryer, that I will replace all my appliances with Mieles. Quite simply, the best appliance I have ever owned.